Raise your hand, all those for whom Advent is your favorite liturgical season! Many of us love this hushed season while our culture becoems more frenetic in its clamor to shop, spend, decorate, party. We may have a foot in both worlds, yet yearn for more time to be quiet, to listen and wait in hopeful anticipation. We want more time to reflect on the rich imagery that Advent offers. The readings the Fourth (and last) Sunday of Advent offer two images of a dwelling place for God. David, with good intention, wants to do a "home improvement" for the "ark of God," building a house of cedar to replace the tent, but God sees otherwise (cf. 2 Sm 7:5). It is among the people that God will establish a house and kingdom that "shall endure forever" (2 Sm 7:13). And when the time comes, the Word mad Flesh seeks and finds a dwelling in the womb of a young Jewish girl (cf. Lk 1:26-38). Over and over the scriptures remind us that God's ways are not our ways. 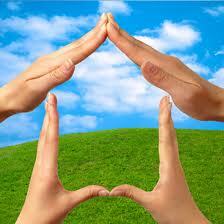 God longs to make a dwelling among us and within us. For a breathless moment, God waits for Mary's "yes" before becoming one of us and finding a home in her womb. Aren't we all home-seekers? Men and women waiting all night in the rain, children sleeping in cars, undocumented immigrants, those of us who live comfortably-all yearn for a place where we are accepted, loved, wanted. Even God desires to find a home in and among us. Even God waits for our "yes". Perhaps God is asking you to reach out to those without homes this week. You can say "yes"! Identify a local homeless shelter and volunteer time or give a donation. Search online to find the 60 minutes segment on "Living in Cars: Homeless Children in Florida." Read the Circle of Protection Statement to address poverty and the federal budget, which the USCCB, FAN and many other Christian organizations have signed. If there is an Occupy group in your town or city, make a visit and ask people why they intend to spend Christmas in a tent in public space. There are now a few Occupy Home groups standing vigil outside a neighbor's home, defending the family against eviction. This post was first published by Franciscan Action Network (FAN) in their December 12, 2011 email. Inspired by the Gospel of Jesus, and the example of saints Francis and Clare, the Franciscan Action Network (FAN) is a collective Franciscan voice seeking to transform U.S. public policy related to peacemaking, care for creation, poverty, and human rights. We're on TV! Check out the Channel 5 News segment by Art Norman. Thanks to Scott and all our guests, volunteers, and staff who participated! As soon as I knew that I would be serving in Chicago, I was excited to spend the holidays in the US (I'm from Germany). The 4th of July was great with all the fireworks, but I've been most looking forward to Thanksgiving. I liked the idea of working together as a team, preparing a great meal, remembering what you are thankful for and of course eating a lot. During our Community Reflection we spent time sharing what we were each thankful for. Most of us said having the opportunity to serve this year and help others who are in need. But also being healthy and having wonderful family and great friends to support us. We've all become more thankful for the simple things in life that many people take for granted. The reality of those we serve each day at FOA has shown us that may people don't have supportive family and friends, the security of knowing where their next meal is coming from, knowing where they'll sleep each night, or good health. When I imagined the typical Thanksgiving, I thought of a large family sitting around a big table with a huge turkey...and I'm glad to saw that's what we did as a community! 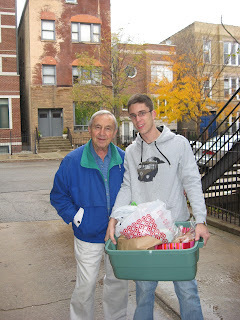 For me the day of our Community Thanksgiving started at 6:30 AM when I, along with Matt, started preparing the turkey. This was actually a lot of fun considering that neither Matt nor I had done this before! It was nice to see all of us working together to set up a beautiful Thanksgiving meal which consisted of probably enough corn to feed half our guests, a wonderful turkey, delicious stuffing, homemade macaroni and cheese, cranberry sauce, mashed potatoes, gravy and sweet potato casserole. It was incredibly delicious, to say the least. We decided since it was our community and a few friends celebrating together and our community kitchen is not large enough to hold all of us comfortably, that we would eat downstairs in the dinning room where we serve our evening meal to the guests each night. Community members had set up a beautiful table arrangement, and the smell of food was just like how I imagined it would be-and tasted even better than I imagined. We were so busy eating that for once we were all pretty quiet, which is rare for our group. The peaceful silence gave me the opportunity to thank God again for all the new moments in my life, for the moments that I share here with the community, and for the chance to give a year of service at our soup kitchen to help our guests. As a life-long resident of Rhode Island and Massachusetts, people might wonder what I'm doing all the way out here in Chicago. It's an interesting tale. What has brought me from Stonehill College out here to Franciscan Outreach Association (FOA)? In order to answer that, I'm going to have to give a summation of my journey through Stonehill. I spent my first year at Stonehill trying to acclimate to college life while balancing academia and trying to have a social life. I decided to take a page out of St. Ignatius' discernment of spirits and, at the beginning of my sophomore year at Stonehill, I looked back at what I liked doing and where I liked being the most. Upon further reflection, it turns out that when I wasn't going to class, doing my homework at the library, or hanging out with friends, I was in the Chapel of Mary. There, I met Timothy Gannon who was involved in student ministry. During my sophomore year, I became a student minister. My times as a student minister were some of the best I've ever had in my life and I could fill up the rest of this article just singing the praises of the program and the people. The student ministers were (and still are) some of the most interesting people I've met at Stonehill and although we were similarly dedicated to the mission of community building and living out our faith, we each had our own strengths and weaknesses to bring to the table. Campus Ministry became my home away from home. My time as a student minister greatly informed my decision to do a year of service after graduation. After corresponding through email with Kendall Grant the Program Director at FOA, she noted that my desire to live out my faith through service was admirable and my experience with working in my home parish's food pantry would be beneficial to the mission of FOA. Soon I was applying, interviewing, and driving out with my family to Chicago. The past 3 months or so here in Chicago have been great. Getting to know the diverse members of the FOA community and working with FOA's guests has been a great joy and a privilege. Being in the middle of Chicago doesn't hurt either! Which brings me to my final point, what is it that brought me to seek a year of service? The most straightforward answer I can think of is my desire for a personal search for perspective and I find that volunteering and giving my time to service has given me the greatest amount of perspective. Living a life that is unfamiliar and learning how others live in places far from what I'm accustomed to has brought me a great deal of insight and much food for thought. However, since I'm still in the midst of my own discernment, it feels strange to me to delve too deeply into that aspect of my year of service. Instead, let me finish with a short list of things that I could confidently suggest to anyone interested in volunteer service and/or a year of service. When you're out volunteering, rub elbows with people. Don't work in silence either. Talk. Talking is where the relationship starts. Find out people's stories or learn a thing or two about them. After you get home from a new and/or challenging experience, reflect on it. Think about what happened. Write about it if that helps you. Put on some music, lie on your bed, and review what you saw, or didn't see. Listen with all your heart, then follow where your heart leads you. This last part is key. God speaks to us through our desires and, in order to truly listen, we must be ready to act on where our hearts guide us. A soldier can take part in battle, but winning the war isn't his objective. I'd have to say that the most common response I got when I told my friends and family what I was going to be doing this year was, "OK, so you're going to go help the homeless. You're going to be trying to get them off the streets, right?" I thought it was a fair question. In fact, it's a question that I asked myself. And, if you had come to me three months ago, I'd say it's what I came to Chicago to do. Kazakhstan artist Nelly Bube, "The Good Samaritan"
Ending homelessness is clearly a noble goal. Although Christ himself tells us "you will always have the poor with you" (Matthew 26:11), He doesn't mean we shouldn't work to end social injustices or seek to improve the lives of those on the margins of our society. 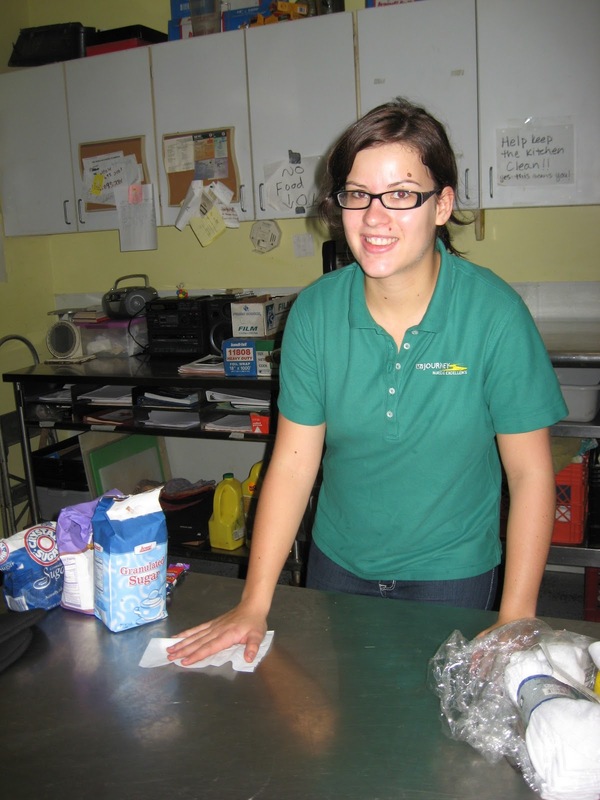 But, three months into my volunteer experience at Franciscan House of Mary and Joseph Shelter, I find myself reconsidering what I was brought here to do. Should 'ending homelessness' be my objective? Is that even reasonable? Will I look back and gauge my success in this endeavor by whether or not I get any of these men off the street? For me, the answer is no. Some staff and volunteers at FOA are dedicated and focused on that end, and that's a great thing. But to find my marching orders-not the Church's, not the organization's, but mine-I needed to get a little deeper than that. In retrospect, it was easy to find. I didn't even have to look-over and over again it's made itself clear to me. In fact, most times I didn't even realize that I was being confronted by the very essence of my mission here until the moment was gone. Everyday I am met by moments of simple humanity, opportunities to realize why I came to volunteer here. Sometimes I've stepped up to the plate and hit one out of the park; sometimes I've failed to muster a swing, and let one of my brothers down. I reach out my hand to someone who doesn't expect me to shake theirs. I call someone by name before they have the chance to remind me what it is. I know in doing so, I help to affirm this individual's identity and value. That's something that's hard to come by when you're one of the faceless members of that group of people that society wants to forget. Or someone mentions something to me in passing that I, personally, wouldn't tell to anyone but my closest friends. And I realize that they're telling me because, well, I'm one of the most stable relationships in their life. There's just no one else to tell. At times, these conversations have shocked me and made me uncomfortable, and I wasn't able to extend myself to that person, or to make myself vulnerable to enter into that conversation. And the moment passes, and I realize I've let them down. 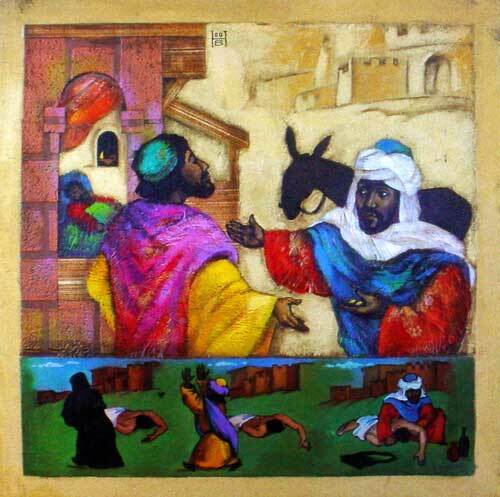 I once heard a sermon in which the priest was talking about the story of the Good Samaritan (Luke 10:29-37). In this story a priest and a Levite, two (supposedly) very holy men, pass by an injured robbery victim on the side of the road on the way from Jerusalem to Jericho. The priest giving the sermon pointed out that these two men would have been taking that route in order to go to their places of worship. Christ specifically notes that these two men purposely crossed to the other side of the road in order to avoid the man lying in the ditch. The reason I bring up this story is that, as I see it, the man in the ditch is our place of worship. That's what this is all about. And so often we cross to the other side of the street instead of going and ministering in the way that Christ is most concerned with. People crowd into churches all over the country and profess to believe the words printed in the Good Book, and yet we can so easily over look that God's very self is present in "these least brothers of Mine" (Matthew 25:40) who are all around us every day. Sure, in the big picture, there remains the lofty goal of winning the war. But we're all just individual people prompted by our faith and conscience to do our part in the battles in which we find ourselves. We've got to focus on what we're capable of, on what's tangible. And our directive is clear: "Your light must shine before others" (Matthew 5:16). We can't forget that most times what that actually means isn't some lofty, possibly unreachable goal. It's just staying on that side of the road and confronting the humanity we all share. I'd like to introduce to you our newest community member Matt Raffol. 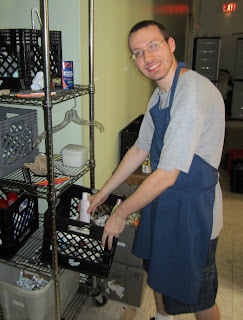 He joined us this month as our new Resident Assistant and lives with the full-time volunteer community. Matt graduated from Boston College after studying psychology and economics. He then volunteered full-time for a year with MercyWorks at Mercy Home for Boys and Girls, in Chicago. As a MercyWorks volunteer, Matt lived in community with 13 other volunteers, and worked in residential care with adolescents who were experiencing a variety of difficult situations. As a former volunteer he has an appreciation for the joys, challenges, and opportunities of communal volunteer living. Following his MercyWorks year, Matt worked at the Sonia Shankman Orthogenic School, in residential psychotherapeutic treatment with adolescents experiencing profound mental and emotional health needs. This summer, Matt will be interning with the Catholic Campaign for Human Development and in the fall, he will continue his graduate studies at the University of Chicago’s School of Social Service Administration as a full-time student. When asked what drew Matt to apply for this position he said, "I was drawn to FOA’s mission to seek personal and societal transformation in the spirit of the Gospel. I am excited to have the privilege of accompanying a group of highly committed people as they journey through a year of life filled with service and community. I hope, through relationships with volunteers and contact with their ministry at FOA, to be transformed toward more aware relationship with God." Matt is also looking forward "to the inevitable opportunities for personal and communal spiritual growth that will come through impassioned conversation about dirty dishes left in the sink. It would also be cool to learn some conversational German." How can I summarize my time here? Simply, it has likely been the most impressive of my life so far. I am learning so much from our community, the guests that we serve, and the individuals that I have met. Ultimately it is the relationships that I have formed with the people I am serving that motivate me. Reflecting, it’s interesting to see how my relationships with the guests have developed. In my first few days at my service site I wanted to fit in. I tried to strike up a conversation with one of the guests. In order to break the ice, I asked him confidently but naively what he was planning to do during the day. He replied that he was intending to stay out of trouble. The guest responded roughly since he was apparently feeling offended by my question. He proceeded by commenting on my question. He compared the question to asking someone about their intention to use the restroom. I apologized for my inappropriate and intimate question and he accepted it. He appreciated it and from then on we chat every time we see each other. What I’m trying to say by mentioning this particular (embarrassing) situation is the following: Even though a few guests may appear rough at first, they’ll treat you as a friend and that’s what I’ve recognized with time. Their appreciation ranges from replying, “thanks a lot” or “God bless you” to small talking and joking. As you build relationships, some of the guests even share their life stories and destinies. The valuable interactions with guests are as different as the guests themselves: happy, when a couple of guests told me that they were going to move into housing; fun, when a guest showed me around a church downtown after I randomly ran into him on a day –off; brave, when a guest answered my question about where he slept during a blizzard and he responded that he had stayed on the streets; sad, when a guest told me that the doctors will not be able to fix his severely sick heart. I’ve grateful for the many relationships I’ve built with the guests here at FOA. I know that these relationships will stick with me long after I’m gone and that these relationships are forming me into who I am becoming.